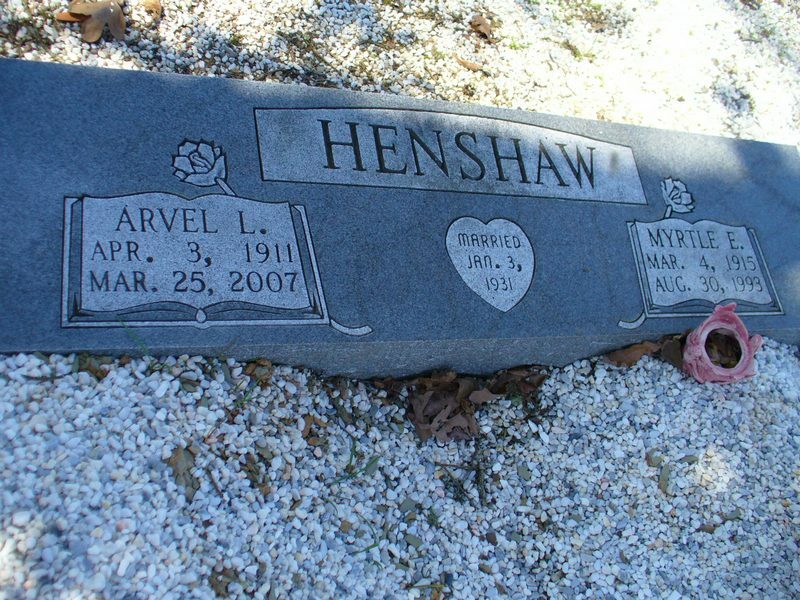 Arvel L. Henshaw, 95, of New DeRoche, passed away Sunday, March 25, 2007 in a local Malvern hospital. He was born April 3, 1911, in Friendship, Arkansas to John H. Henshaw and Elizabeth Oaks Henshaw. He was a member of Prairie Bayou Church of Christ. He owned his own dairy farm. Some of his favorite pastimes were gardening, spending time with family and attending gospel singings. He was a bass singer. He is survived by one daughter, Laverne Hughes and husband, Clinton of New DeRoche, Ark. ; one brother-in-law, Arthur Magby of Hot Springs, Ark., four sisters-in-law, Amanda Hardin of New DeRoche, Ark., Helen Channell of Poyen, Ark., June McClenahan of Lono, Ark., and Lois Beason of Hot Springs, Ark. ; nine grandchildren, Sharon Smith and husband, Don, Alan Cansler and wife, Mary, Mike Cansler and wife, Pam, Karen Hughes, Teresa Matthews and husband, David, Diane Gardner and husband, Kiah, Terry Henshaw and wife, Lisa, Ricky Henshaw and Sheri Parish and husband, Darren; 14 great-grandchildren; 11 great-great-grandchildren and numerous nieces and nephews. He was preceded in death by his wife, Myrtle Henshaw, one son, Harlon Henshaw, one daughter, Erma Burris, two great-grandchildren, Krista Ritter and Crystal Cansler, one great-great-grandson, Justin Rivers Matthews, two brothers, Marvin Henshaw and Ralph Beason, and two sisters, Hattie Henderson and Eunith Magby. Funeral services are scheduled for 2 p.m. Thursday, March 29, 2007, at Prairie Bayou Church of Christ. Visitation will be held 6 - 8 p.m. Wednesday, at the funeral home. Interment will be in Prairie Bayou Cemetery. Pallbearers are Jim McMahan, Kiah Gardner, Darren Parish, Gerald Bunn, Wayne Ritter, and Darrell Henshaw. Honorary Pallbearers are Dr. Bruce Burton and his caregivers, Sandy, Shelia and Lori. Arrangements are under the direction of Atkinson Funeral Home of Malvern, Ark. (501) 332-2711.